Points Needed: 16750 Games are not compatible with mobile and tablet devices. Please add this title to your Wish List and sign on to your the first club account from a desktop computer to complete your redemption. NOTICE: Activation key must be used on a valid Steam account, requires internet connection.SPELLFORCE COMPLETE PACK SpellForce 1 Platinum SpellForce 1 The Order of Dawn SpellForce 1 Shadow of the Phoenix SpellForce 1 Breath of Winters SpellForce 2 Gold SpellForce 2 Shadow Wars SpellForce 2 Dragon Storm SpellForce 2 Faith in Destiny Digital Deluxe Edition SpellForce 2 Faith in Destiny Fai… th in Destiny Soundtrack WorldMap in digital form Artbook in digital form	SpellForce 2 Faith in Destiny Scenarios SpellForce 2 Faith in Destiny Scenario 1: Flink's Secret Diary SpellForce 2 Faith in Destiny Scenario 2: The Golden Fool SpellForce 2 Faith in Destiny Scenario 3: The Last Stand	SpellForce 2 - Demons of the Past SpellForce 2 - Demons of the Past SpellForce 2 - Demons of the Past - Soundtrack	About the gameIn times of war and chaos you will assume the role of a young man, who is supposed to liberate the entire world of Eo from the new, nameless evil. Along with a group of diverse heroes and a dragon as trustful companions, you will fight to gain information about this mysterious new enemy and thereby discover your own true destiny. With daring and courage you will be able to succeed in this brand new, epic, strategic RTS/PRG-Mix that combines the storylines of the previous Spellforcegames and continues further.system requirementsWindows - Minimum OS: Windows XP/Vista/7 (32 or 64 bit) Processor: Intel or AMD Simgle-Core (2.5 GHz) Memory: 1 GB RAM (1.5 GB with Windows Vista/7) Hard Disk Space: 4 GB free disk space Video Card: Direct3D compatible with 256MB RAM and Shader Model 2.0 support DirectX®: 9.0c or higher Additional: Mouse, keyboard Internet connection for activation Windows - Recommended OS: Windows XP/Vista/7 (32 or 64 bit) Processor: Intel or AMD Dual-Core (2.5 GHz) Memory: 2 GB RAM Hard Disk Space: 4 GB free disk space Video Card: ATI X1900 or nVidia 7900 with 256MB RAM DirectX®: 9.0c or higher Additional: Mouse, keyboard Internet connection for activation© 2012 by Nordic Games GmbH, Austria. Published by Nordic Games GmbH. 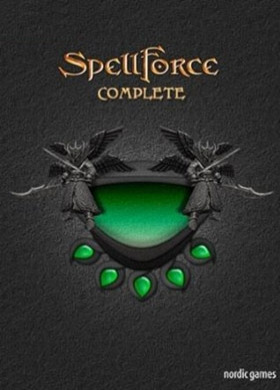 SpellForce is a registered trademark of GO Game Outlet AB, Sweden. All other brands, product names and logos are trademarks or registered trademarks of their respective owners.